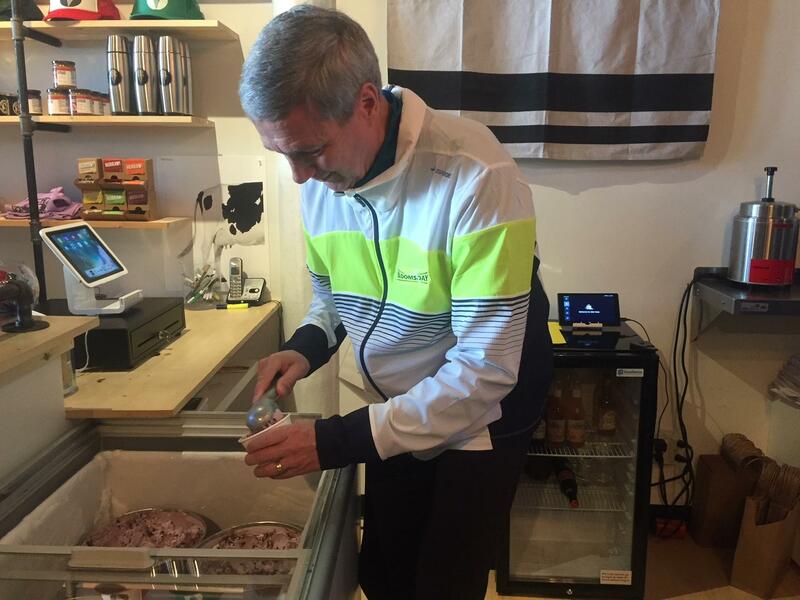 UPDATED: Mon., April 1, 2019, 9:54 p.m.
A local ice cream shop has sweetened retirement for Bloomsday founder and race director Don Kardong with an honorary flavor pairing his favorites — huckleberries and chocolate. Kardong served up scoops of this so-named “Darkness and Chaos” ice cream to dozens of customers Monday at Sweet Peaks Ice Cream in downtown Spokane. Kardong was at Sweet Peaks serving the huckleberry ice cream with a fudge swirl and miniature chocolate chips to celebrate its April 1 release. It will be available at Sweet Peaks through May. The ice cream’s name was inspired by a quote from Kardong, “Without ice cream, there would be darkness and chaos,” which appeared in a story about the Olympic athlete in the late 1970s. Kardong was instrumental in developing the Bloomsday race, which began as a small idea between Kardong and former Spokane Mayor David Rodgers after a chance meeting in an elevator at Spokane City Hall. Bloomsday has become a tradition since its inception in 1977. Kardong has announced he will retire as race director after this year’s Lilac Bloomsday Run on May 5. More than 35 people visited Sweet Peaks to sample “Darkness and Chaos” within the first hour of the ice cream’s release, said Michael Conrad, general manager of Sweet Peaks. Sweet Peaks, founded in Whitefish, Montana, in 2010, features unique ice cream flavors with locally sourced ingredients. Sweet Peaks opened its downtown Spokane store at 415 W. Main Ave. last year. Published: April 1, 2019, 4:59 p.m. Updated: April 1, 2019, 9:54 p.m.